We are now offering FREE Search Engine Optimization Services for qualifying non-profit organizations and charities who want to leverage the power of internet marketing and search engine optimization to promote their cause. If you or someone you know is involved in a non-profit or charitable organization, please take a moment and read this or share this message with someone who should. Our company is founded upon the belief that we can deliver superior value to businesses and professionals. We enjoy helping people, business, and organizations gain positive results from their websites and online marketing. We like providing value, and we especially like companies who do the same. So, we are introducing a new program that allows non-profit organizations and charities to partner with us to receive Free Organic Search Engine Optimization (SEO). Every non-profit organization and charity should have a website so that people can learn about them and their cause through the Internet. If supporting or promoting a specific mission, such as raising money, cleaning up the environment, promoting awareness, or disaster relief, being discoverable and accessible through the internet is a vital component to the success of the mission. In order to be discovered by internet users, a website must be properly optimized for the search engines. But here’s the problem as we see it..
Search engine optimization (SEO) is not a cheap commodity. In fact, it can be very expensive.. In most cases, young and even well-established charitable organizations have a difficult time budgeting for such a marketing expense. Most of the not-for-profit companies and organizations we speak to simply cannot afford to invest the amount of money SEO companies want to charge them. Its a shame. These charitable organizations are designed to help, yet they are not receiving much support. Or if they are receiving help, its in the form of monetary donations, which they are then required to allocate towards other operating expenses. Non-profits and charities need marketing too.. But do they have a marketing budget? Rarely. And if they do, its probably not for search engine optimization. So, we have decided to give them a break. 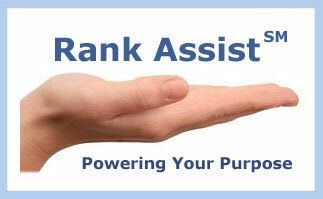 Our new SEO program for non-profits and charities is called Rank Assist? – a program we’ve designed specifically around the purpose of helping those who are helping. Let us power your purpose.. Whether your raising money to fight cancer, building a foundation that supports children, or cleaning up the environment to save baby seals and sea-life, we want to help you. Every person on our team holds a charity or cause close to their hearts, and we know you do the same. Its time we join forces. We’re ready to rally behind you, power your purpose, and help you make sure your message is heard and mission accomplished. Contact us today to learn more about our Rank Assist? program. Simply fill out the form below and a Rank Assist? specialist will contact you about getting started.